Honours ended even as two in-form rivals struggled to create clear-cut chances at Carter’s Park. Jake Clitheroe’s header put Holbeach United in front on 13 minutes but Deeping Rangers got a stoppage-time leveller from Scott Coupland’s penalty. Tigers boss Tom Roberts said: “We knew their weak links but once we scored, we stopped doing what we had done well. “They had a lot of possession but they didn’t hurt us at all. Travis Portas only made one save late on which led to the penalty. “We’ve got no complaints and we have to accept that. “I don’t know how they finished with 11 men on the pitch because the referee seemed to book the wrong man in the first half. “The skipper (David Burton-Jones) and number nine (Scott Mooney) had both committed a lot of fouls. “But I actually thought all three officials did well. “It’s definitely a case of two points dropped and it feels like a defeat when you concede so late on. Matt Warfield and Jordan Thomas will return to the Holbeach squad for Saturday’s home game against Kirby Muxloe. Travis Portas is likely to continue in goal as Rick Drury has a groin injury. Deeping manager Michael Goode was sent off following comments to the referee at half-time. He was joined on the sidelines by coach Martin Bond when penalty appeals were rejected just past the hour mark. Goode said: “I was really pleased with a point and I thought we deserved it. “It was a very even game and their style is a total contrast to ours. But I’ll take nothing away from them because it’s effective. “I was disappointed in the goal we conceded. We could have done better to stop the cross and we should also be dealing with the header. “In the second half they had a couple of half chances from our mistakes but we kept trying to play the right way. “We had a stonewall penalty when he handled it twice. If that had been given and we had scored it then we would have been in the ascendancy looking to go on and win it. “Coupland missed a one-on-one but the referee gave a penalty when Mooney got himself across the challenge. “Both teams have played better but there was a bit of nervousness from playing a local derby. Goalkeeper Richard Stainsby will be back for Saturday’s trip to Newport Pagnell Town. 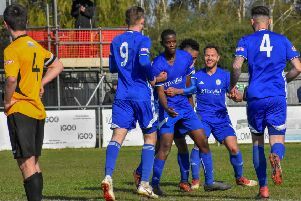 Goode added: “If we had been offered four points from three tough games against Desborough Town, Holbeach and Newport Pagnell then we would probably be close to taking them.